Two “1k” races for me on Saturday, the single and the double. And then the “Open Single” sprint at the end of the day. Masters single was broken into four “finals” with three competitors each, grouped by age. So I was up against Milan Viktora senior from Hodonin and Mr Milkov from Ostrava. Both should be easy prey. I was in lane 1, which is the outer lane. Here is a Google earth view. The start is at the bottom right of the picture and the finish is where the black and light blue trajectories meet. The line-up at the start is diagonal to compensate, but it is not enough. Normally, lane 2 is the best lane but because there was very little current due to the drought, lane 3 was the best lane this weekend. Viktora was in lane 3. Out of the start I was leading. Milkov fell back quite rapidly and I was also rowing away from Viktora. However, in each turn he cought back some space. 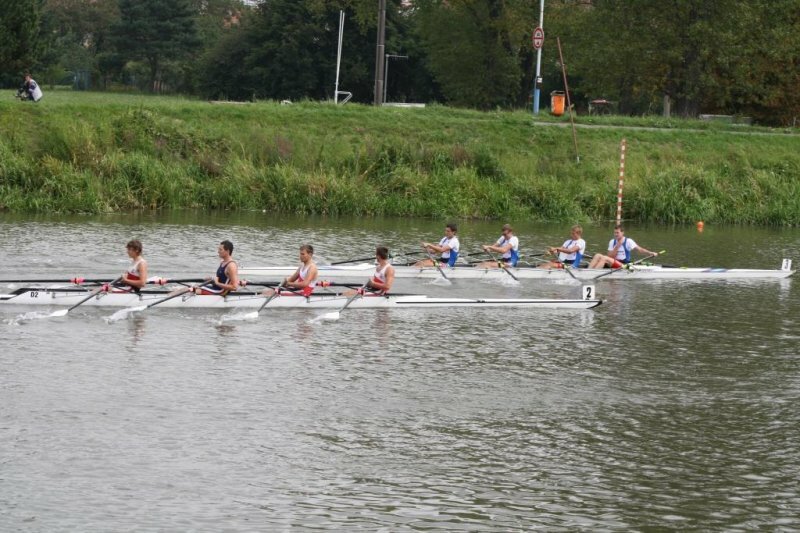 The referee was sending me back to lane 1 when I tried to cut the corners a bit, so I ended up rowing the full lane 1 distance. At the last turn he came back to one length behind me, so I had to keep the pressure up until the last meters of the race. 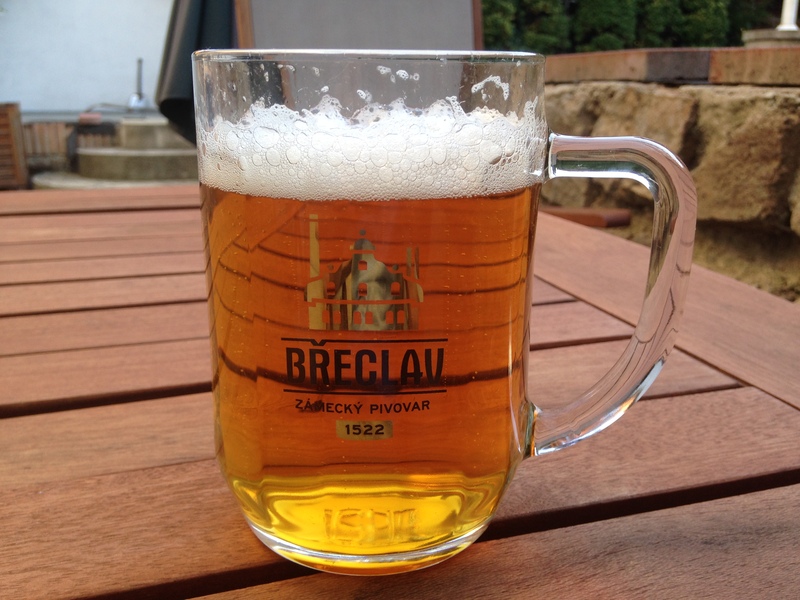 The prize was a medal and a “City of Breclav” beer mug. My time over the “1k” was 2:55.58 and Viktora finished in 2:59.84, Milkov in 3:21.48. Clearly, the course must be shorter than 1km. Actually, it looks like 750m according to CrewNerd. My time was the 2nd time of all the races. Cernak rowed 2:47. 73. Two hours later we had to line up for the double race. We were in lane 2 with Neratovice in lane 1 and Ostrava (Cernak and Pesat) in lane 3. Ostrava are very fast and experienced guys who row the double together for ages. They are a bit older than we, though. I thought we had a chance to beat them. We were out of the start fast and leading, but our technique was quite bad. Martin on stroke was rowing short and racing. I should have adapted but I stuck to my long and strong finish, with the result that I had difficulty following his high stroke rate. At each turn they took back a little of our lead and by the last turn they were suddenly rowing in front of us. We couldn’t catch them any more on the last straight 250m. Smart rowing from the old chaps! 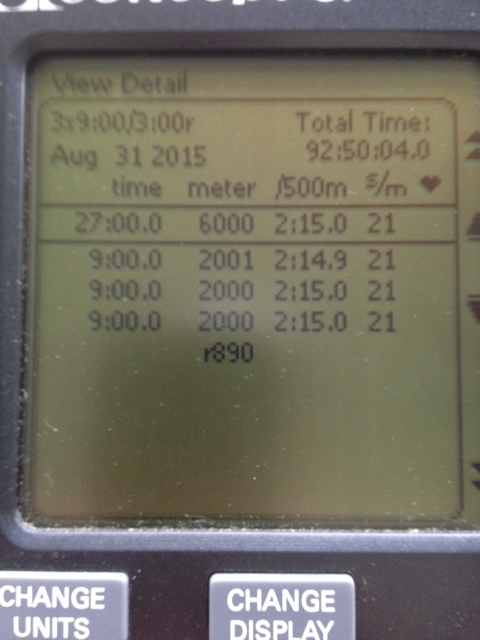 At 7pm I rowed the “Skif Open”. I gave my place in the masters 8+ to another guy in order to be ready for skif open, as I was rowing in the first heat. Nineteen single rowers had registered. I was the only Masters rower in the field. The rest was a mix of juniors and seniors. 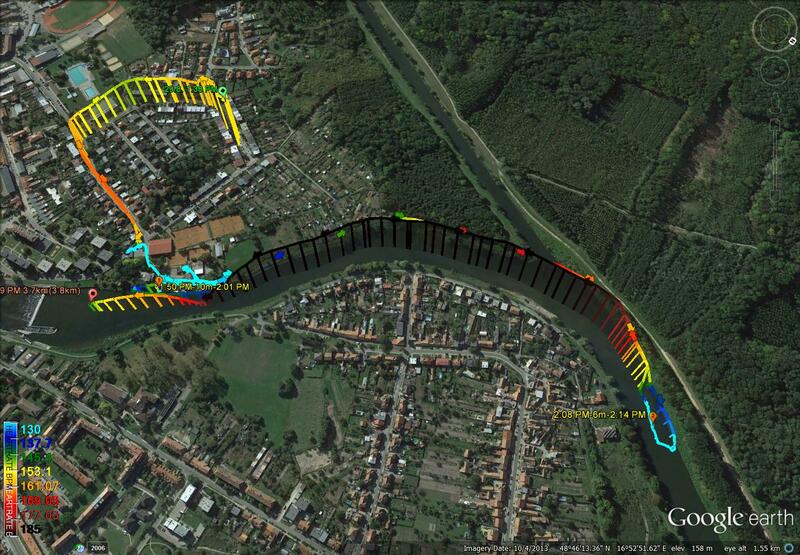 This race is rowed on a straight line, and the total distance is a little over 300m. There were 7 heats with 3 or 2 rowers. The winners of the heats would be through to Sunday’s semifinals. The others would return to the start immediately to row the repechage. 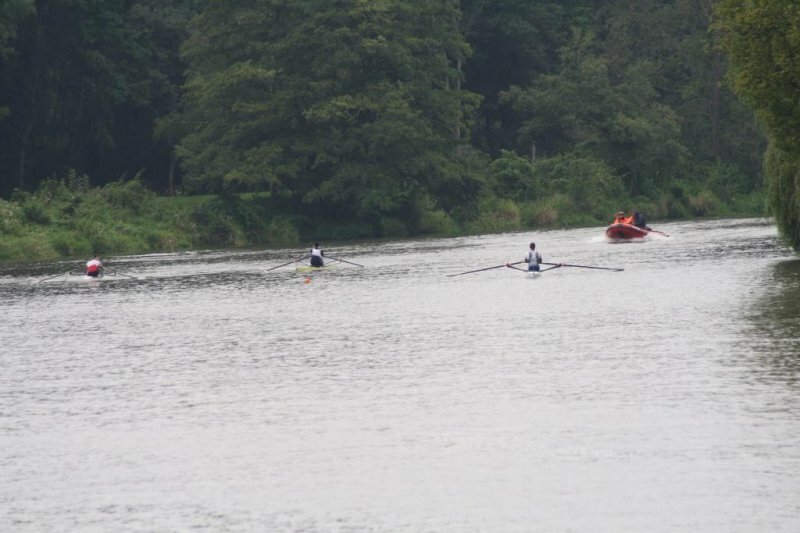 The four winners of the repechage would row back to the start immediately to row the “K.O. round”, to determine the 2 last semifinalists. So the easiest way to progress is to win the heat, because surviving the repechage and KO round would be extremely hard. I blew my start. The second stroke was unbalanced. I came in third place in 59.77 seconds. The winner was clear after 10 strokes (he finished in 53.30) and I was one length behind number two, so in the last 10 strokes I released the pressure a bit. Back to the start to join the other 12 losers. My time was 56.92 seconds. Back to the start to join the other 4 survivors. I had a disadvantage that I was up against the winner of the first repechage, so I had less time to recover. This time my opponent was leading out of the start. In the first 200m I managed to stay within half a length of him but then my strength left me and he won. My time was 59.24 and he beat me by 3 seconds. All in all a pretty tiring day but the sprinting was good fun. 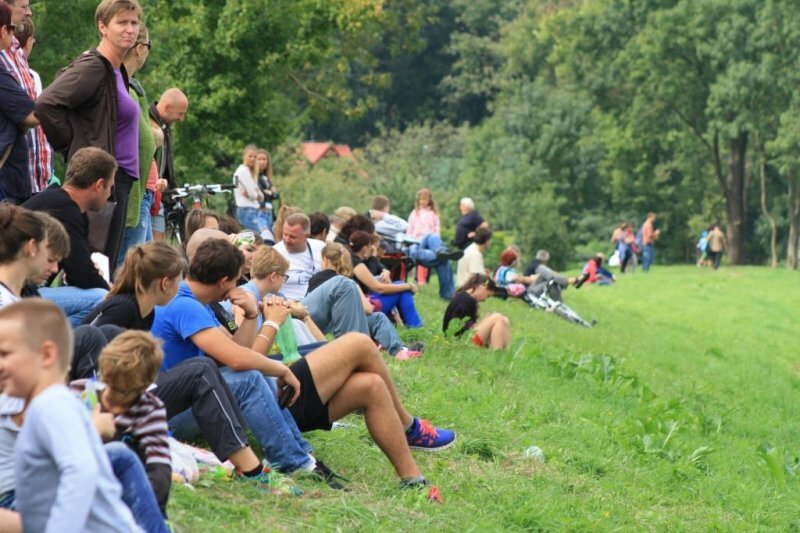 The Břeclav races are close to Brno, on a quiet river, so an ideal place to race also for the less experienced kids. 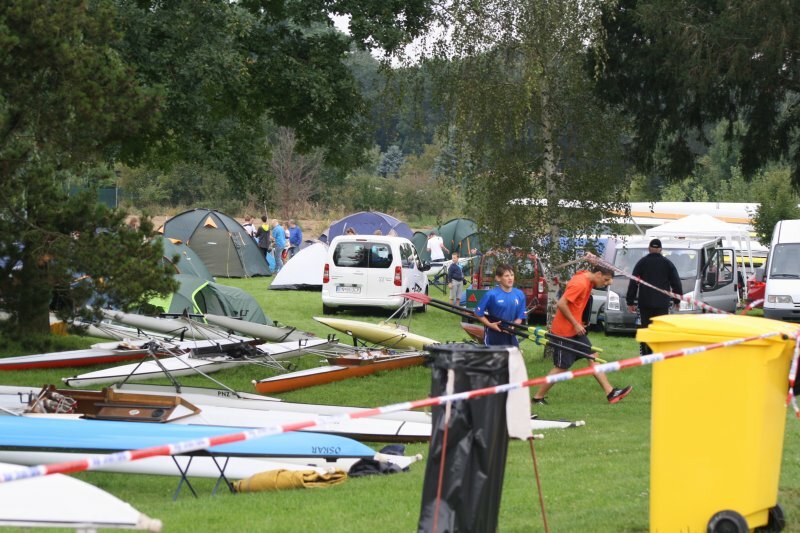 Therefore, our club participated with as many teams and boats as possible. So my new trailer was facing its maiden voyage. 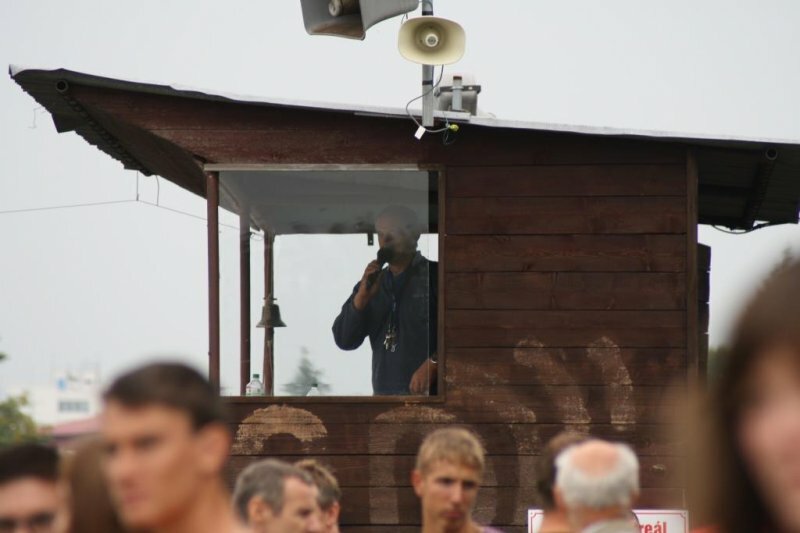 I took Friday afternoon off to drive the trailer to Břeclav, and was looking forward to do a quick training on the Dyje river, in the double with Romana. 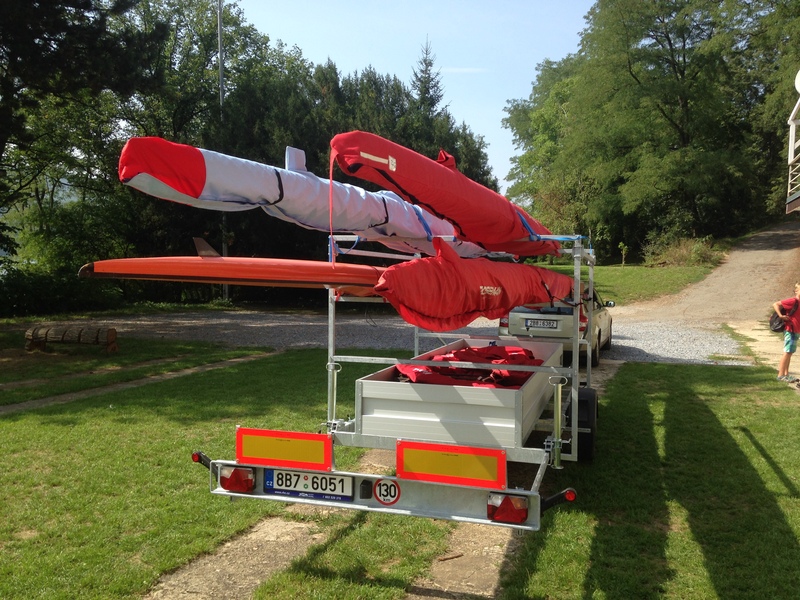 The plan was to leave Brno at 2pm, arrive in Breclav by 3pm, prepare the boats. Then I would have to join a work related call for an hour, and the training was planned at 5pm. Hopefully, it would also be a little cooler. Temperatures during the day were around 34 C.
The reality was that we left Brno at 3pm, got stuck for an hour in a traffic jam in the highway around Brno (works), and arrived in Breclav at 5pm. 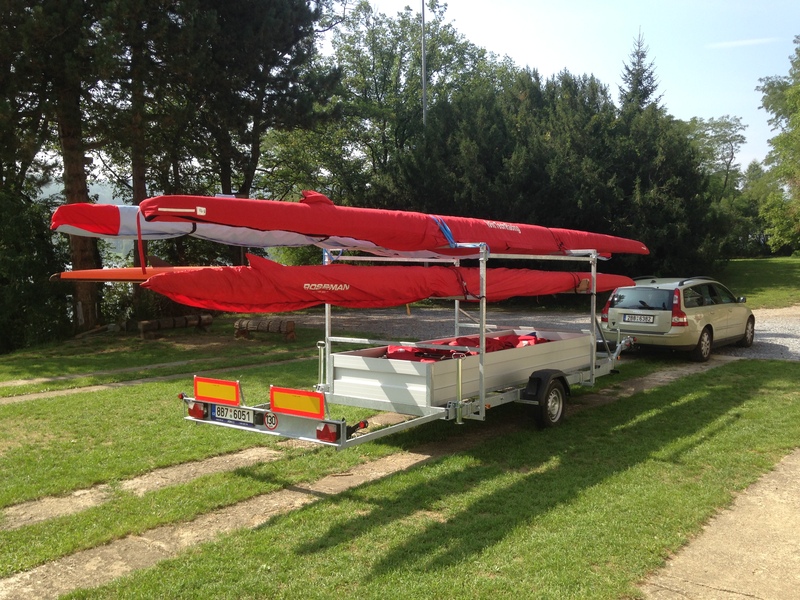 Of course I was quite nervous driving the trailer, but everything worked like a charm … until we arrived at the rowing club in Breclav. 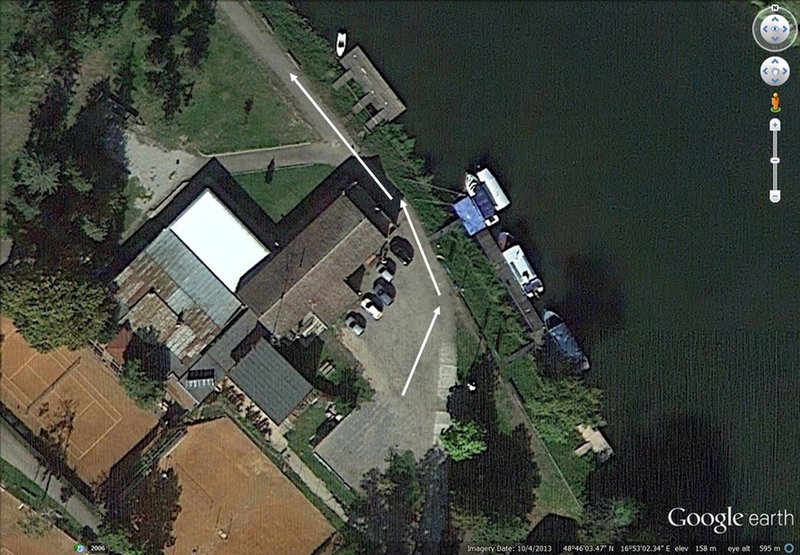 The rowing club has 2 areas for temporary boat storage. One area is right where you enter the venue. It’s a big parking lot with a grassy area next to the river bank. I wanted to leave the trailer and boats there. 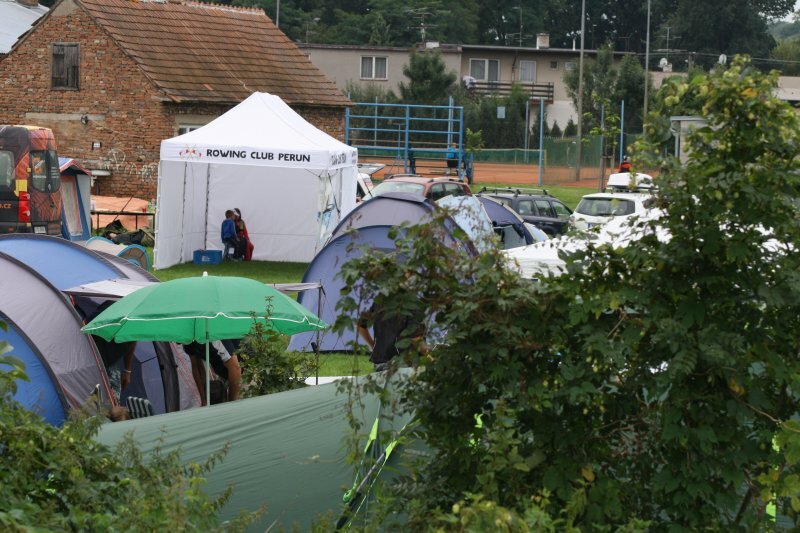 On the other side of the club house there is a big grass field where the kids sleep in tents and more boats and trailers are parked. Our club’s big trailer was already there. It is indeed more handy to have both trailers together, especially since my trailer had the box with seats and the box with race numbers. To get to that second field you have to turn onto a narrow path between the club house and the river. That’s where my trailer had its first “insurance event”. I started driving towards that path, taking a slight turn left to enter it. I was driving really slowly. Unfortunately, as the trailer swings out during the turn, it’s left fender hit a small Suzuki that was quite unluckily parked next to the club house. Here is a situation sketch. The white arrows roughly indicate my trajectory. I had moved to the left onto the parking lot to make place for other trailers, so the left turn around the building was a bit sharper than if I would have driven on the “road”. The dark car on the Google earth photo is very close to the real position of the Suzuki. The fender of my trailer completely deformed the plastic back fender/bumper of the Suzuki, even though I stopped immediately when I heard the scraping noise. My trailer’s fender had no damage whatsoever, not even a scratch. Got out of the car, apologized to the driver of the Suzuki, and we sat down to do the paperwork. My fault of course, even though I personally would never park on that spot on a race weekend, knowing that about 20 trailers would pass there. Also, I don’t understand why they didn’t scream when they were standing next to their car, I was driving slowly and they literally saw the collision coming in slow motion. Well, that’s what we have insurances for. The paperwork took about 30 minutes. We prepared the boats but I decided to skip the rowing. It was getting too late. Today was going to be “death by lactate” day. 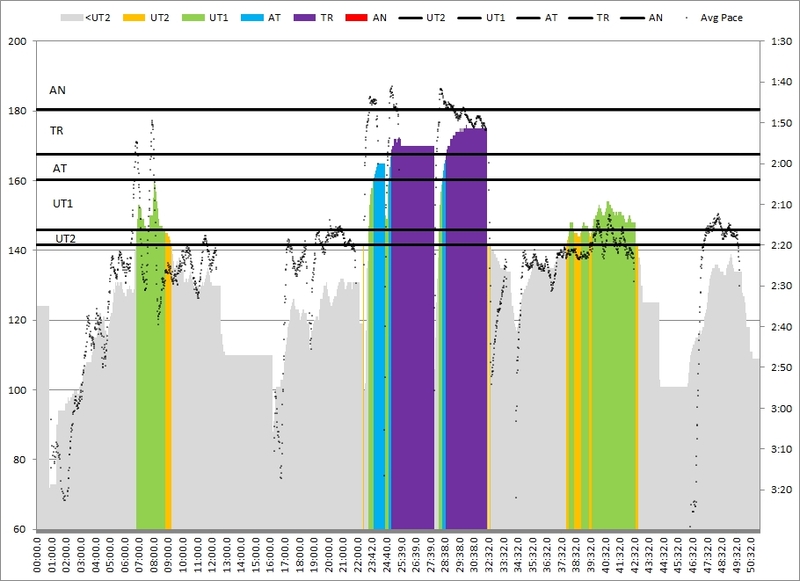 Six am, just 10 hours after the 2x750m session, this was going to be a tough one. In the double with Radek, after more than two weeks. Unfortunately, Radek had to get used to rowing the double again, so we were “off” technique wise. The stroke was not a compact thing. 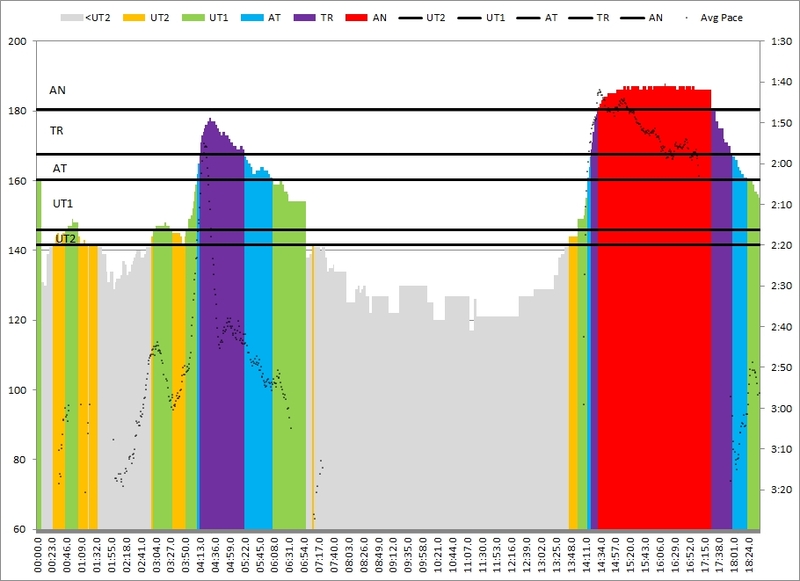 There were balance issues, and power curve disconnects between bow and stroke. The temperatures were below 10C and there was fog. We did a long warming up with a few bursts at higher stroke rate and some technique drills. Then we got ready for the main thing. First 250m from standing start. Difficulty to get the rate up and stuck at 30/31 because of the technique disconnect. But 250m is easy to survive. Hard stop at the end of the 250m, getting ready for another 250m from standing start, 30 seconds after finishing the first one. Heart rate got up a bit more. Breathing got heavier. Managed to get the stroke rate slightly higher. After completion of the second 250m, bring the boat to a full stop and sit still. Watch the sun above the mist, the forest in a beautiful green color. After 2 minutes, start to get ready for a full out race pace 1km from a standing start. Legs started to burn after 10 strokes, the kind of burn you feel in the final 250m of a hard fought 1km race. Technique started to fall apart after perhaps 20 strokes. Difficult again to keep the stroke rate above 30, let alone to bring it up to the desired 34spm. Somehow survived the first 500m, then started counting strokes. If I were in a single, I would be at serious risk of HD-ing at this point. The double is better. Nobody wants to be the first to stop rowing. So two rowers who desperately want the pain to stop, still keep rowing. Pace was going the wrong way slowly but surely. Steering was pathetic. Technique was very far from our (quite low) standard. This was one of those “difficult sessions”. Perhaps the struggle with the leg and arm pain was keeping me at a lower effort and prevented me from pushing HR into red. 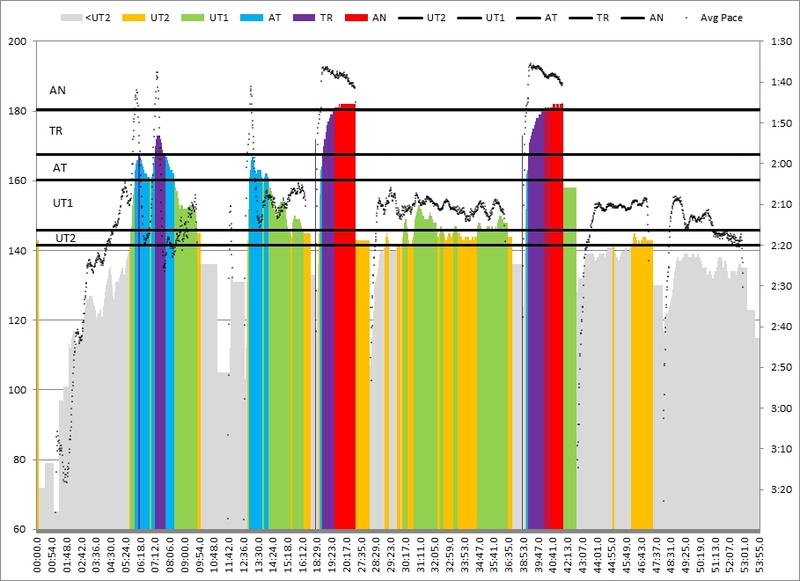 Perhaps it was just a difference between morning and evening rowing. 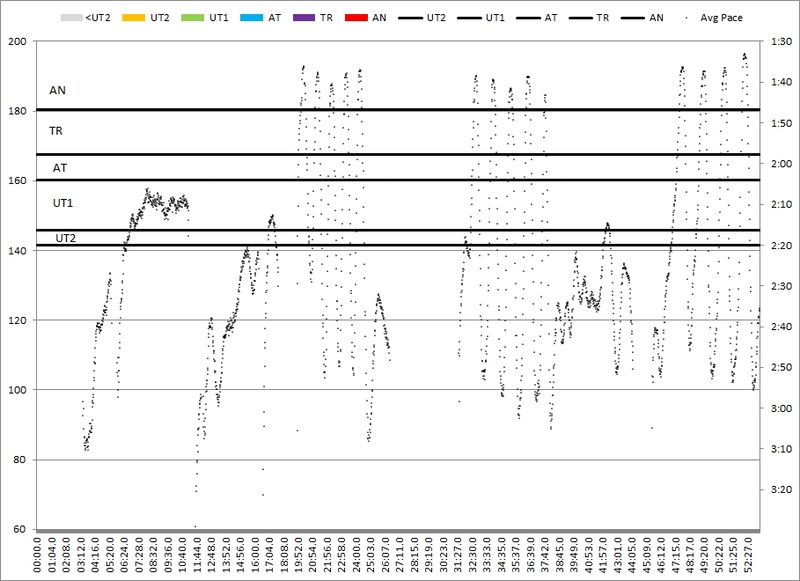 Yesterday’s max HR was 182, vs 176 today. A 3km cooling down to complete this short session of 8km in total. Had to be at work early so there was no time for a long lactate flushing cooling down. Walking up the hill from the rowing club to the car parking brought back the leg pain. It was not a pleasant session and not a good one technique wise, so I guess it was a very useful session to have completed. Races coming weekend. I am curious to see if I will be able to get the stroke rate up to sprint values in the single. If not, I may have to work harder on this to get ready for Belgium, or decide to change back to my old gearing? Today’s temperatures were a pleasant 18 degrees, vs above 30 on July 3. Flat water and no wind today, a slight crosswind back in July. Warming up with a few high stroke rate bursts. This felt very good. We hadn’t trained together since the Nationals, due to vacation and illness. Then we did two practice starts, rowed to the start of the 2k course, dialed up a 750m with standing start and off we went. Bowman Tomas had permission to pull half strength. We asked #2 Martin to pull double strength to compensate :-). So 2:26 and 2:28 at lower stroke rate. Not bad and it felt good. Perhaps it is a good idea to remind Martin that he has to pull hard ;-). Tomorrow: “Death by lactate”! Was planned for Thursday but my double partner has to go to a seminar, so we have to do it … Wednesday AM. 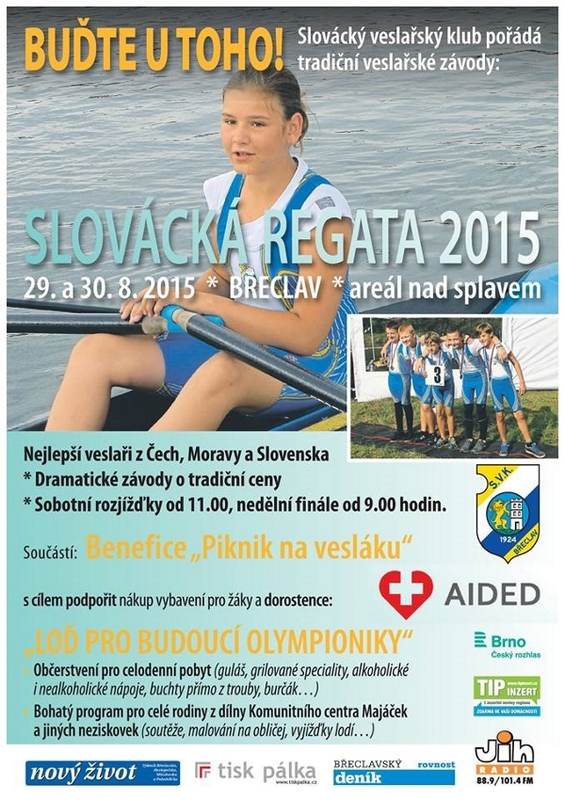 Coming weekend I will row double and single Masters at regional regatta in Břeclav. Quite an unregular 1km course with a big turn. Good prep for Belgium.